Lou Yanong and Andre Brouillette also talk about the controversial kiss episode. Pinoy Big Brother Otso Batch 2's controversial love team Lou Yanong and Andre Brouillette met the press for the first time at a media conference yesterday, April 3. 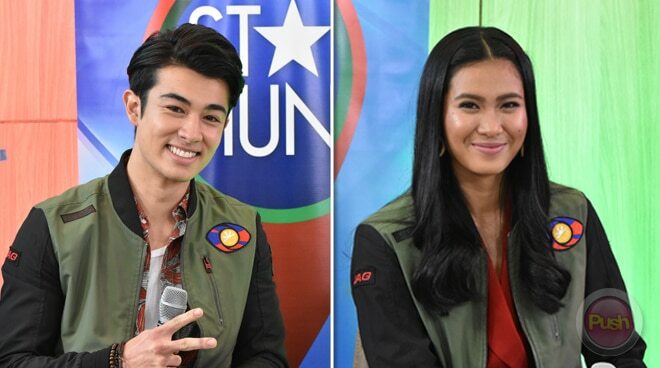 The LouDre tandem took the opportunity to address rumors about their relationship being "scripted." "[I think] it's just something to laugh [about]. Because we do really love each other," was Lou's immediate reaction. Andre and Lou, who officially became a couple during the Sunday (March 31) episode, explained to the press that their feelings are real and not just an act. PBB Otso Batch 2’s Big Four were all smiles meeting the press today at #StarHuntGrandMediaCon. Andre kisses her now-girlfriend Lou in front of the press. "You know a lot of it is new for me. I've never felt these feelings before towards Lou. And everything that I'm doing is genuine. It's not like there's any script or anything. I actually do really really mean it when I say I've never met any more wonderful girl like Lou. "Coming in here - of course both of us we don't know each other. And we believe in ourselves that we can make it till the very end. But along the way, I'm very happy to say that I've been able to find an amazing love and an amazing girl like Lou," Andre explained to the press. The two also had a chance to talk about the controversial PBB kiss episode, which made headlines when it was aired. According to Andre, he learned a lot from the incident. "When you drink a lot of alcohol, you do things that you may regret or wouldn't intend to when you're sober. So with that I believe that first kiss I wanted to save for the right time," he said. Lou agreed with Andre that the first kiss should be special, something they were not able to consider that time. "Para sa akin hindi lang po siguro na-consider nung time na 'yon since we're intoxicated. May mga batang nanunuod and na-realize na lang po namin the next day na yung mga choices namin talagang kailangan, the decisions we make, really we have to think about it twice even," Lou said. Andre has already apologized to Lou's father about his actions in an episode following the incident.